Author’s note: This post wraps up the responses to my earlier prompt for the Carnival of Journalism blog project. Feel free to contribute your own blog responses, and I’ll add them to the thoughts compiled here. As I’d hoped, our group stretched my prompt about longevity and meaningful content in a variety of directions. Engagement remains a fluid, malleable idea in today’s landscape, and I doubt we will agree on a singular definition in the weeks and months to come. But these responses provide some sharp insights to move our thinking forward. Each response seized a separate piece of the journalistic puzzle to dissect: the journalistic process, the journalist/content creator, the technology, and the journalism itself. Take half an hour or so to scan these posts; you will find thoughts and ideas to inspire your own work. David Cohn (@digidave), our ringleader and chief content officer of Circa, focuses on his organization’s idea of the “follow” for stories. 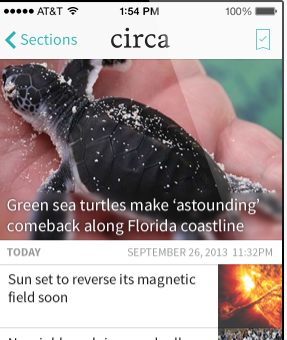 Circa taps into the idea of journalism as a process. Instead of focusing on a singular story, Circa watches news events and topics unfold over time, combining several stories into an overall news narrative. This ability to “atomize” individual stories allows Circa add them for context as news evolves and permits users to “follow” news topics. We can see how many people have “followed” a story in the last hour, the last 24 hours and how many have unfollowed (happily always our lowest number). The follow count doesn’t represent “eyeballs” to monetize with banner ads but rather relationships. Each follow is a decision by a reader to keep in touch, for us to keep track of what they know and alert them when something new happens they aren’t aware of. In a sense, the approach is akin to Quora’s ability to follow particular questions, a strategy embraced by the New York Times on its AskWell blog. Donica Mensing (@donica), associate professor at the University of Nevada, Reno, takes the question away from the content and focuses on the content creators themselves. What do skillful, passionate creators experience personally when a piece of content takes off? If we find journalists who are moved and excited by what they are doing, it’s likely they will be connected to subjects and communities that feel similarly. It’s another set of data points to help us define and measure what has lasting impact, what engages, what is meaningful. She has compiled a list of research questions that we could ask journalists to delve into this topic (a #jcarn collaboration, perhaps?). I’m increasingly convinced that it’s less about choosing any one particular “golden” metric that will help us to quantify quality or impactful or engaging content, and more about being smarter and more sophisticated about the way we think and talk about the constellation of metrics available to us – and especially the story we as journalists tell advertisers. Steve Outing (@steveouting), blogger and media futurist at the University of Colorado, Boulder, chose to focus the idea of content on “significant news that makes you angry.” Though that’s been the goal of many an investigative journalist for decades, Steve makes an important update to that notion: News organizations — especially in today’s interactive environment — should empower their audiences to take action. The ideal, in my view, is that for appropriate stories (like those we’re discussing) there’s a section at the end — “Take action” — with ways for readers who are angry about what a news story has uncovered, to do something (more than just rant in Comments). And don’t just do the old thing of listing the time and place of the protest, for example; provide actions that readers can take, whether it’s to sign a petition or commit to volunteer work. A side note: I mentioned the book Spreadable Media in my original prompt, and one of the authors, Sam Ford, responded in the comments by drawing in Anderson’s notion of the Long Tail into the mix and noting the importance of archives in the Internet age. Thanks to all who participated. If you decide to add your own thoughts to the mix, please let me know and I’ll add them here. Thanks, Jonathan! Great question and useful wrap-up post (with generous links). You’re welcome, Donica! Hope to see you at AEJMC in Montreal! Previous#jcarn: What is the best way to measure meaningful content?